All your questions about daycare cameras are answered in the following article. The following subjects will be covered. You may click these links to jump to a particular section. Do I Really Need Daycare Cameras? Get ready for a shock... the truth is there is no such thing as a "daycare camera"! Daycare cameras are simply video cameras that have been installed in a child care center. What sets "daycare cameras" apart from other surveillance cameras is the way they are configured, streamed and supported. You may install the same type of camera into both a pizza restaurant and a daycare center. The actual camera may be the same but the configuration, streaming and tech support should be MUCH different for the daycare center! For example, in the pizza restaurant you may zoom your cameras out to catch a wider angle while in a child care center it is preferable to zoom in slightly to give a more detailed picture of the teachers and children. Your motion settings are also something to consider. A crawling child will generate less motion and therefore you may need your sensitivity set higher or recording set to round-the-clock. In your pizza restaurant the only one viewing the video remotely over the Internet is the owner or manager. In this case your tech support needs are low. However with many parents & grandparents viewing the video from all types of devices your tech support must top notch and always available. Streaming Considerations: This is a very important point! As we have already stated the pizza restaurant will not have very much online viewing at all. In their case traditional surveillance streaming will suffice. The child care center on the other hand will have a lot of people streaming the video so their needs are greater. With traditional streaming every viewer takes a little bit of your available bandwidth (internet speed) and can cause real issues if you have more than 1 or 2 viewers at a time. 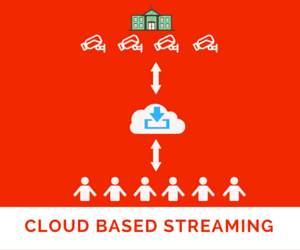 A true "daycare camera system" will re-stream your video from a high capacity cloud server to ensure that quality streams are always available for your parents. The infographic below shows how your users should connect to a cloud server rather than making a direct connection to your child care center. This is how a "daycare camera system" should be set up but this is NOT how a tradional camera system works. As you can see, "daycare cameras" and regular surveillance cameras may be the same hardware but they are in reality two VERY different things! NEXT: Do I Really Need Daycare Cameras?